– Says Mike ‘Warhawk’ Scott as he slams two basketballs on the ground simultaneously revealing his prosthetic legs. Scott is a wheelchair basketball player, a NWBA star, a national champion, a tournament MVP and is currently playing for the 2008 Paralympic Games in Beijing. He was born with spina bifida. And he doesn’t make excuses. 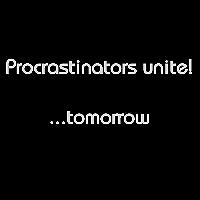 Now that we’ve stopped procrastinating (right?) and figured out what direction we want to head towards, we need to eliminate one vital element in order for us to reach nirvana – Excuses! There are only two things that will happen when you have a task at hand. You either deliver, or you make excuses on why you can’t do it. Kerri Strug did not make excuses when she broke her ankle during her the Olympic Gymnastics competition. The US women were on the verge of an historic win in the team competition in Atlanta. Then the unthinkable happened: Dominique Moceanu, the youngest member of the team, fell on both of her vaults in the last event of the day. So now the question is, do you have that same motivation within you? Well, if not, then come back everyday to get your daily dose of motivation here at 365DaysOfMotivation.wordpress.com (shameless plug).